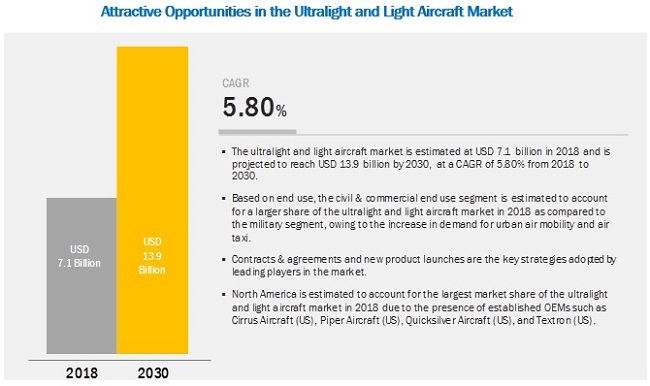 [155 Pages Report] The ultralight and light aircraft market is estimated at USD 7.1 billion in 2018 and is projected to reach USD 13.9 billion by 2030, at a CAGR of 5.80% from 2018 to 2030. Factors expected to fuel the growth of the ultralight and light aircraft market include the increasing demand for recreational flights and deliveries of Unmanned Aerial Vehicles (UAVs). The global deliveries of ultralight and light aircraft are increasing due to the demand for air taxi and urban air mobility. Based on aircraft type, the ultralight aircraft segment of the ultralight and light aircraft market is projected to grow at the highest CAGR during the forecast period, as these aircraft are used for various air taxi services and chartered flights, which is driving the growth of these aircraft deliveries worldwide. However, rise in the demand for ultralight aircraft in urban air transport is driving the growth of ultralight aircraft market. There is a growing demand for passenger drones and Unmanned Aerial Vehicles (UAVs) in the ultralight and light aircraft market across the globe. The trend is highly evident in developed economies, wherein funds raised by technology developers are driving the growth of this market. Based on end use, the ultralight and light aircraft market has been segmented into civil & commercial and military. The civil & commercial segment has been further studied for various applications, such as personal & passenger, commercial cargo, training, agriculture, survey & research, medical, and others, whereas, the military segment has been further studied for search & rescue, cargo, training, and other applications. Most developed countries, such as the US, the UK, and countries in Western Europe are framing new infrastructural policies to emphasize urban air mobility initiatives, which are projected to drive the market for civil & commercial applications. Whereas, commercialization of this technology is likely to take place in the Asia Pacific region during the forecast period. The Asia Pacific ultralight and light aircraft market is projected to grow at the highest CAGR during the forecast period. This growth can be attributed to the increasing number of ultralight and light aircraft deliveries and rise in demand for UAVs which are expected to drive the growth of this market. In January 2019, Bell Helicopter, a Textron company (US), revealed the configuration and full-scale Vertical-takeoff-and-landing (VTOL) air taxi vehicle during CES 2019. The air taxi, Bell Nexus, is powered by a hybrid-electric propulsion system and features Bell’s signature powered lift concept incorporating six tilting ducted fans that are designed for safe and efficient air travel. In October 2018, the Pilatus (Switzerland) opened a new facility in Broomfield, Colorado US for PC-12 and PC-24 light aircraft models which is expected to enhance the company’s production capacity. In January 2017, Pilatus announced signing 3 PC-21 fleet orders, for a total of 21 PC-21s, of which 17 are for the French Air Force and 2 each for the Royal Jordanian Air Force and QinetiQ. Together, these orders are worth over USD 292.7 million. In July 2018, Tecnam (Italy) announced contracts from Hellenic Air Force (HAF) of Greece for the supply of 12 low wing trainer aircraft, P2002JF, and in the same month, the company won another contract from the Thai Aviation Academy to provide 2, P2002JF and 1, P2006T twin aircraft. What are your views on the growth perspective of the ultralight and light aircraft market? What are the key dynamics and trends that govern the market, such as drivers, and opportunities? What are the key sustainability strategies adopted by leading players operating in the ultralight and light aircraft market? What are the new emerging technologies and use cases disrupting the aviation industry? When do you think the air taxi will be commercialized? Which are the key applications wherein ultralight and light aircraft play a significant role? What are the key trends and opportunities in the ultralight and light aircraft market across different regions and respective countries? 15.4 American Legend Aircraft Co.
15.7 Costruzioni Aeronautiche Tecnam S.R.L. The study undertook major activities to estimate the current market size for ultralight and light aircraft. Exhaustive secondary research was undertaken to collect information on the market, the peer market, and the parent market. The next step was to validate these findings, assumptions, and sizing with industry experts across the value chain through primary research. Both, top-down and bottom-up approaches were employed to estimate the complete market size. Thereafter, market breakdown and data triangulation procedures were used to estimate the market size of segments and subsegments. In the secondary research process, various secondary sources, such as General Aviation Manufacturers Association (GAMA) Annual Report, D&B Hoovers, Bloomberg, BusinessWeek, and ultralight and light aircraft manufacturers, unmanned technology developers, and various magazines were referred to identify and collect information for this study. Secondary sources included annual reports, press releases & investor presentations of companies, certified publications, articles by recognized authors, and ultralight and light aircraft databases. After arriving at the overall market size—using the market size estimation processes as explained above—the market was split into several segments and subsegments. To complete the overall market engineering process and arrive at the exact statistics of each market segment and subsegment, data triangulation, and market breakdown procedures were employed, wherever applicable. The data was triangulated by studying various factors and trends from both, the demand- and supply-sides, in the ultralight and light aircraft industry. Aeropro (Slovakia), American Legend Aircraft (US), Autogyro (Germany), Cirrus Aircraft (US) Costruzioni Aeronautiche TECNAM (Italy), Evektor-Aerotechnik (Czech Republic), Flight Design General Aviation (German), P&M Aviation (UK), Pilatus (Switzerland), Piper Aircraft (US), Pipistrel (Slovenia), Quicksilver Aircraft (US), Textron (US), and Vulcan Air (Italy), among others. This research report categorizes the ultralight and light aircraft market based on aircraft type, end use, flight operation, propulsion, technology, material, and region. Along with the market data, MarketsandMarkets offers customizations according to the company’s specific needs.